We are happy to announce version 1.6 of the Proximity Aware app. This new version not only comes with some minor bug fixes and minor improvements, but now users will be able to easily share the app to their friends and family. And not only that, but we have added a new feature called: My Watchlist. We keep improving the user experience and marketing tools of our auto dealer clients with creative tools. 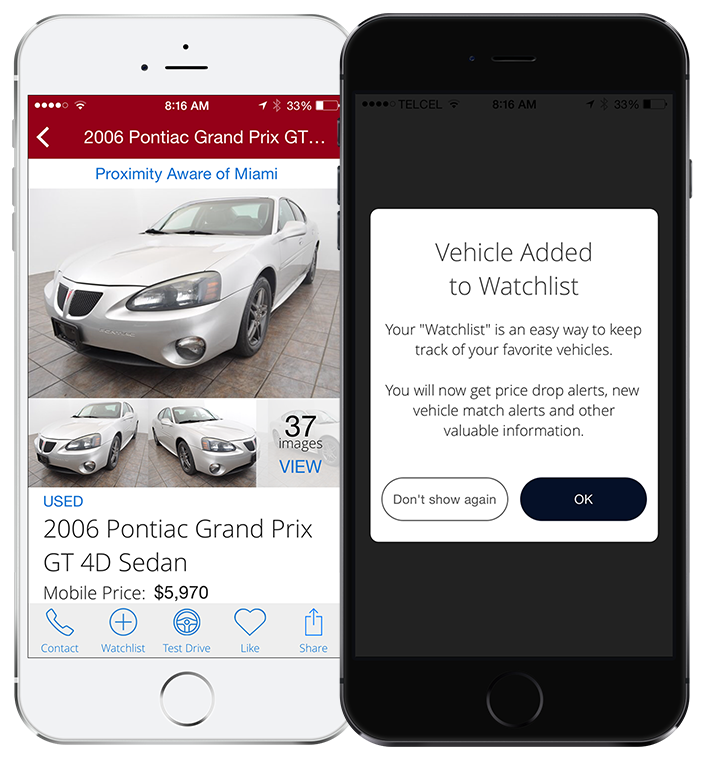 This time we created “My Watchlist” which allows users to Watch vehicles while browsing through the inventory. Watched vehicles appear on the new My Watchlist section on the app. Which gives users easy and direct access to the vehicles they are more interested in. from here they will be able to keep track of price drops, look at similar vehicles, and view other suggestions that match their preference. Also, if users can’t find a specific vehicle, they will be able to manually create trackers based on Make, Model & Year. This will allow users to be notified whenever a vehicle arrives that matches their preference. This update increases the power of our Proximity Aware product.